I’ve been making CraftSanity wooden peg looms for more than two years and I’m thrilled that my little sisters have both recently gotten into weaving. Yippee!!! I just love it when they get into a craft I absolutely love. 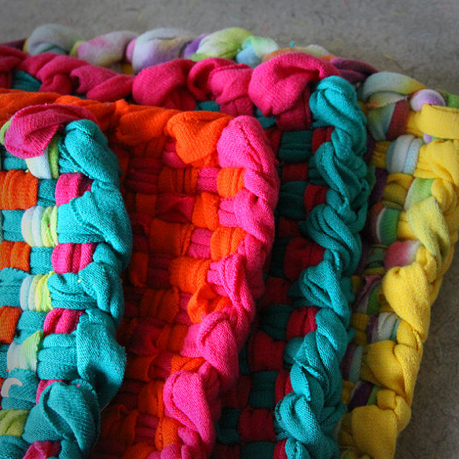 My youngest sister, Julie, whipped up the bright pot holders above on her 17-peg CraftSanity Loom. Check out her shop if you’re interested in snagging an upcycled pot holder, a canceled stamp necklace or her other assorted vintage finds. Seeing my sister’s pot holders reminds me to ask you what you’ve been making. Please post links to your latest projects in the comments below. I’m especially interested in hearing about the things you’ve been making for your home. Happy Wednesday! Why would the largest consumer nation ever consider raising tariffs?The response would be retaliatory tano.fsfEciromics supercedes all other realms of human interaction. It allows people and groups that despise eachother to enter into contracts that are mutually beneficial. Steven, it is a very bad idea because the CNE had already told the opposition they couldnâ€™t organize primaries in March because it collides with the planning they have to do for the other elections.In case something happens and the primaries can not be held in February, then Allup picks the candidate, not the people. Then we will have a re-play of the previous presidential elections, where the opposition candidate did not have the support of the majority of the Venezuela = Chavez forever. Para acabar com essa praga e todos os outros problemas que vivemos hoje no Brasil sÃ³ existe uma alternativa: NÃƒO PERMITIR QUE OS CADASTRADOS EM BOLSA FAMILIA OU QUALQUER OUTRA BOLSA VOTE EM QUALQUER ELEIÃ‡ÃƒO.EstÃ¡ clarÃ­ssimo que o PT usa o mecanismo de Bolsa do Governo para comprara votos e eleger bandidos.Ã‰ preciso impedir o voto de bolsistas e o PT nunca mais se elege. PONTO FINAL! I am wondering if someone could point me in a good direction in learning how to use these PSD files in my web designs, I am using WordPress and need to learn more about how this stuff works? Kievsky, I’ve started a small gardening project this summer, based on your urging. It’s not going well. The strawberries are great, and the beans look promising, but I planted sweet peas not knowing they only bloom flowers but give no peas! Hah hah! I can laugh, but I am planning on expansion next year, with lessons learned.